In this May’s installment of the Twin Cities Live “Wonder Women” series, Elizabeth Ries meets up with Shawntan. Fox 9 Interview with Shawntan Howell, Jalyn D. and Ahmira R. Aired on April 8, 2016 on Fox 9 with News Anchor Alix Kendall. KSTP Interview with Shawntan Howell, on March 7, 2016 on KSTP 5 with News Anchor Brandi Powell. 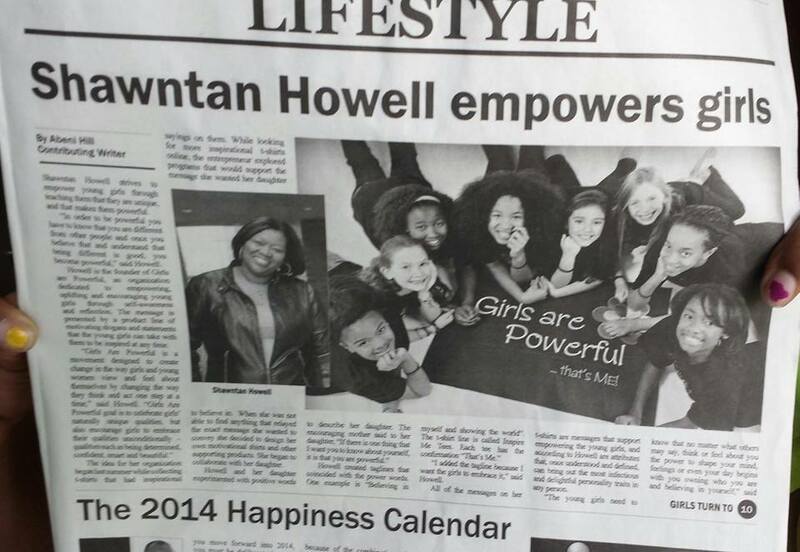 Shawntan Howell, Girls Are Powerful Founder, featured by the Spokesman Recorder Newspaper. 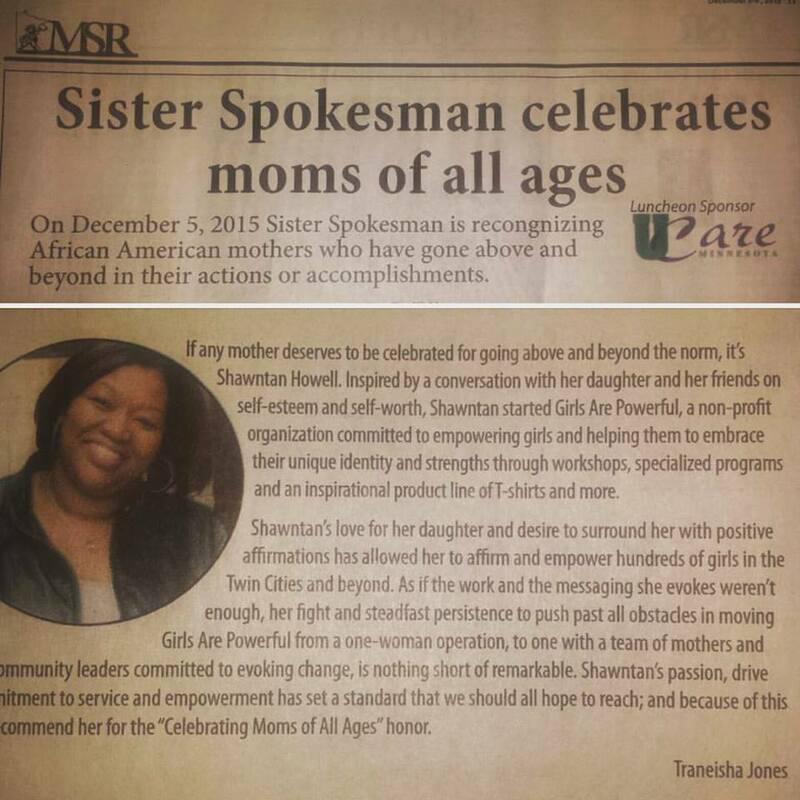 On December 5, 2015, the Girls Are Powerful founder was recognized by the Spokesman Recorder Newspaper as a Mother who has gone above and beyond in their action or accomplishments. For us that represents all of her hard work she has put in to bring you Girls Are Powerful. The nomination says it all: “If any mother deserves to be celebrated for going above and beyond the norm, it’s Shawntan Howell. Inspired by a conversation with her daughter and her friends on self-esteem and self-worth, Shawntan started Girls Are Powerful, a non-profit organization committed to empowering girls, and helping them to embrace their unique identity and strengths through workshops, specialized programs and an inspirational product line of t-shirts and more. G irls Are Powerful Founder Interview on Mom Talk with Denise LaRosa. 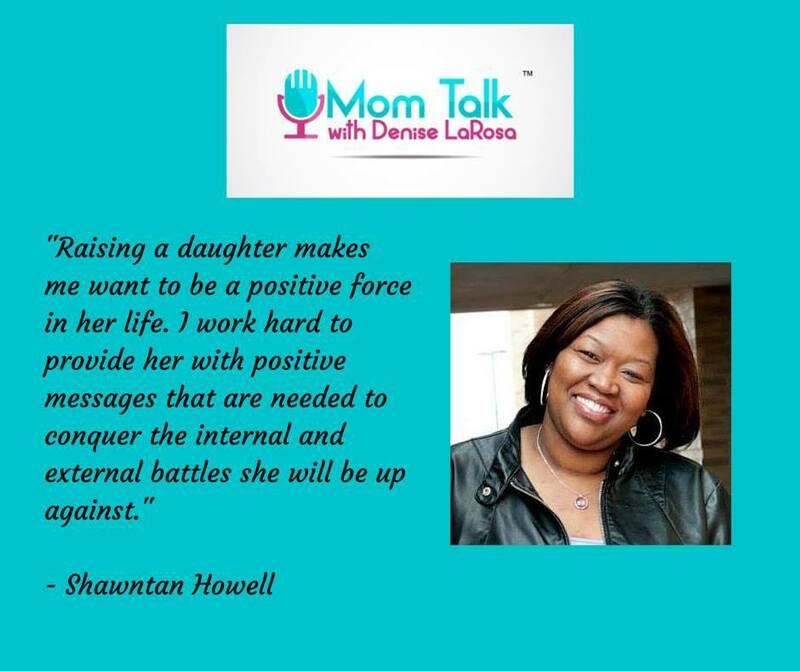 Mom Talk with Denise LaRosa Podcast featured Girls Are Powerful’s Founder Shawntan Howell Aired on April 30, 2015.